Build community and enrich our organization by donating your goods or your time and skills to the museum! Museum members far and wide have the opportunity to help. Maren Vernon grew up in North Bend, and learned about the history of the region from a young age thanks to her father, former North Bend High history teacher Steve Greif, and elementary school visits to the old Coos History Museum building. She kept abreast of the planning, funding, and building of the beautiful new facility after moving to the East Coast. 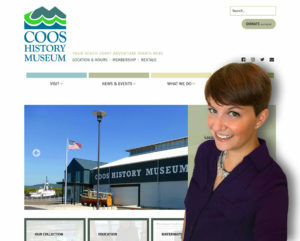 As she learned website development, she frequently noted to her father that the museum would benefit from an updated website to ensure that visitors could discover the beauty and rich history of the region. In 2017, Maren volunteered to do just that—create a modern and accessible site. Community service was instilled in Maren watching her parents volunteer and through her own experiences in high school Key Club. She believes a community is as strong as its individual members and that those who can give (big or small) should give.